Weird week this week for me, with reporting mixed in with new-house stuff and some exciting non-work stuff. But still there are these extra things I need to share. Gears of War Comic Tops All? This didn't become a post because it was old and nebulous and I didn't have time to try to confirm it. But a report from earlier in the month from Rich Johnston, one of the comic book world's top gossip reporters, indicates that the best-selling comic for Superman and Batman publisher DC Comics last year might have been the Gears of War comic. They're White? 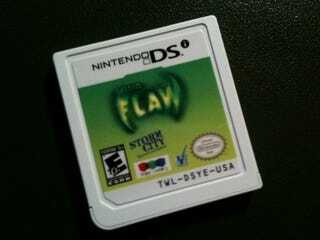 I got my first DSi-only cartridge game, Storm City's augmented-reality game System Flaw. I'll try it this weekend, but even if I wind up writing about it, I don't think the color of its cartridge would merit a full post, right? There Won't Be Blood I'm throwing out a bag of fake blood that was sent here, to Crecente's attention, months ago. I don't remember for what. I may be sending him some swag he can use at the annual Kotaku charity event. But a bag of blood doesn't travel well. Not if packed by me. So no blood. No post about it. Just chucking it. Games I Got But Didn't Write About (Yet?) Style Savvy, System Flaw, Tekken 6, Ben 10 Alien Force Vilgax Atacks and some stuff I'm not permitted to mention yet. There was going to be something else in here about an unusual fighting game. But my draft write-up began to seem like a full post. So it will be one on Monday. Can't hardly wait, right?